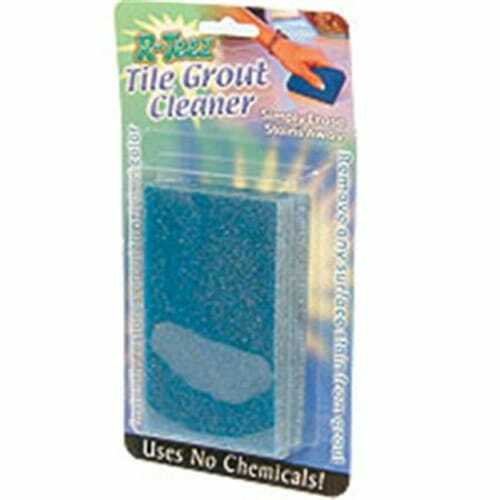 StainEraser R-Teez ( R ) Tile Grout Eraser: Restores grout to its original color! StainEraser R-Teez ( R ) Tile Grout Eraser: Restores grout to its original color! Cleans surface stains such as coffee, wax buildup, algae, mildew, soap scum, rust, calcium, and red clay, from your tile grout instantly using no chemicals! Works both wet or dry, sanded or unsanded, sealed or unsealed grout,any color! Use on grout only, not on tile. Package contains 2 bars 4-3/8" x 3" x 1/2" and 4-3/8" x 3" x 1/4" thick. Cleans approximately 500 lineal feet.